Definition at line 14 of file CREAnimationControl.h. Definition at line 7 of file CREAnimationControl.cpp. References freearr_x, freearr_y, myAnimation, myLastStep, myStep, myWidgets, and step(). Definition at line 36 of file CREAnimationControl.cpp. References animations_struct::faces, animations_struct::facings, myFacings, myWidgets, animations_struct::num_animations, and new_face_struct::number. Define the animation to display. animation what to display, must not be NULL. facings if -1 then uses the facings of the animation, else number of facings to display. Definition at line 30 of file CREAnimationControl.cpp. Referenced by CREArtifactPanel::artifactChanged(), and CREAnimationPanel::setItem(). Definition at line 81 of file CREAnimationControl.cpp. Definition at line 29 of file CREAnimationControl.h. 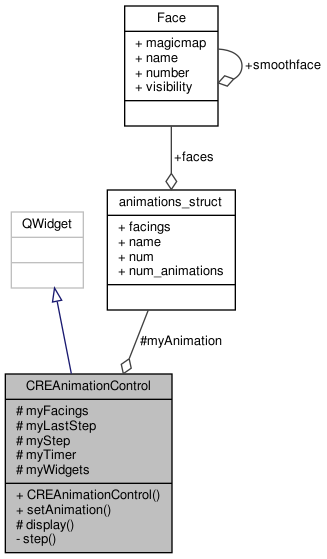 Referenced by CREAnimationControl(), setAnimation(), and step(). Definition at line 32 of file CREAnimationControl.h. Definition at line 31 of file CREAnimationControl.h. Definition at line 30 of file CREAnimationControl.h. Definition at line 35 of file CREAnimationControl.h. 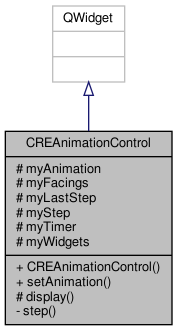 Referenced by CREAnimationControl(), display(), and step().